Regardless of which neighborhood you call home in the city, there are multiple decorated trees on display for all to see. From any of the apartments to rent in Manhattan, you can easily visit the best of the best this year on an all-out holiday extravaganza. While you’re out and about shopping, make sure to visit these thirteen. 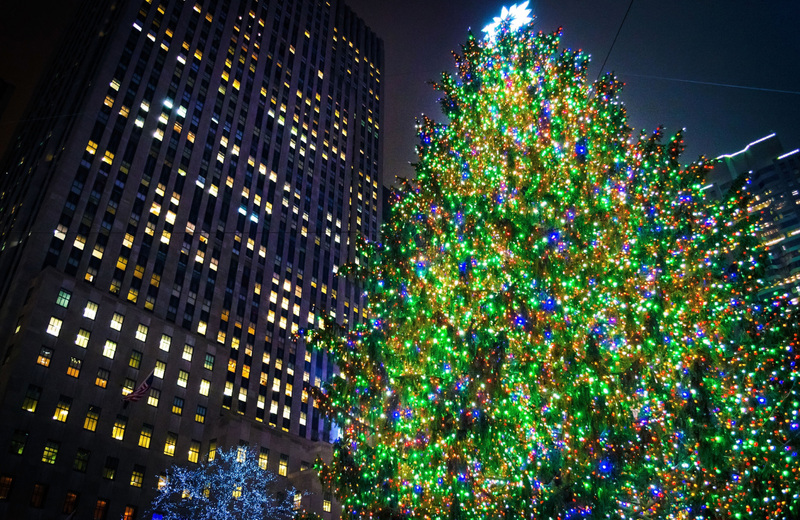 Grand, bold, and beautiful, the tree at Rockefeller Center is spectacular display. Lightly covered in snow and colorful twinkling lights, this tree uses it’s bold pine green to make a statement. The star on top is one of the largest in the city, and shines bright each night to make this tree stand out in the center. The Plaza incorporates a tall-thin pine with nostalgic decorations from head to toe. White and gold ornaments help this tree blend into its surroundings while the sparkling white lights and green color help it to pop. Nearly an inch away from the room, the grandeur of this tree cannot be understated. Wall Street keeps their tree simple. It relies on a burly build and thick branches to stand out amidst the off-white color of the building. Upon its limbs rest multi-colored ornaments that shimmer and sparkly in the daylight. At night, colored lights help illuminate the pillars of the Wall Street building. Red, gold, and silver cover the entirety of this tree at Lotte New York place. From the ground to the top, barely an inch of pine can be seen as bows and more dazzle under the bright, shining star placed at the top. The surrounding decorations make for an immersive holiday experience. One of the brightest in the city, Madison Square Park’s tree takes white decoration to the next level. Illuminated by glowing white lights and an enormous bulb on top, you can spot this tree from blocks away. Hanging amongst it branches are a series of colored lights as well, which you have to step closer to notice. Sporting patriotic colors and shining a bright blue in the night, this Christmas tree is one dazzling display of AC current and the magic that holiday lights can bring. Ball-shaped ornaments, snowflakes, and hundreds of lights come together to make this the centerpiece of Bryant Park’s Winter Village during the holidays. Simple and quant, yet spectacular. The library sticks with traditional decorations that bring about a nostalgic feeling reminiscent of holidays when you were young. It’s a must see on anyone’s list. Tall, thin, and places right above the Radio City marquee, this tree blends right in with the neon lights of the music hall. It features numerous colors that sparkle and shimmer with the incorporated white lighting, and really makes the corner of the block a magical sight. Another simple tree, this one relies heavily on its green coloring and the falling snow to make it stand out. The white lights illuminate branches underneath the heavy snow that collects on the pine. Positioned in front of Washington Square Park’s arch, it makes the perfect holiday tradition to an already gorgeous locale. It isn’t really a tree, but it is a sight to behold. This glowing neon-like green tree illuminates the Oculus’ center. It might not be traditional holiday lights, or even LED ones, but it is a mesmerizing sight. Simply decorated with colorful holiday lights that offer the glow of pre-led design, the tree outside Lincoln center is a humbling symbol of the holidays. There’s no fancy star on top and no additional decorations, just the beauty of a tree with a little added lighting. Gold snowflakes, white lights, and shimmering star illuminate the tree at South Street Seaport. Placed on the stone floor with ships as its backdrop, it’s one of the more unique trees in the lineup thanks to its location. Make surer to stop by and snap an Instagram worthy photo. This plastic tree is painted all white with numerous colored bulbs hanging from its faux branches. Instead of a star at the top, several strings of light reach out from the tip as they cascade over your head before wrapping around other trees. With the added post lights, it’s truly magical experience. From your home at Renoir House, all of these trees are easily viewable thanks the new Second Avenue Station. Each of these homes provides the quintessential New York City rental experience. Residents indulge in newly redesigned apartments featuring modern kitchens, baths, and barnwood style flooring. A renovated lobby, corridors, and elevators paint the picture of luxury living. These beautifully appointed, no-fee apartments find their home in the coveted Upper East Side neighborhood, offering a classic New York combination. Each home within Renoir House features the finest in modern furnishings. Spacious closets with custom shelving accommodate your wardrobe, while dual panel solid core doors provide a sense of safety. Window treatments and satin nickel door handles complete the finer touches, while undermount cabinet lighting illuminates Bosch stainless steel appliances and open kitchen layouts. Contemporary vanities, brushed nickel Moen fixtures, and Caesarstone complete these decadently designed homes. The community at Renoir House offers thoughtfully designed amenities that cater to your city lifestyle. Concierge services handle your daily obligations, while an on-site gym allows you stay active. Relax after a long day on the roof deck or landscaped patio, or mingle with your neighbors in the lobby and common areas. Pet-friendly accommodations, on-site management, and on-site parking all work to elevate your sense of city living. We invite you to experience life in Manhattan in an entirely new light, one bathed in luxury and wrapped in convenience. These homes are anything but another city address, they redefine the concept of rental life in the city. Welcome the quintessential New York Experience. Welcome to Renoir House.